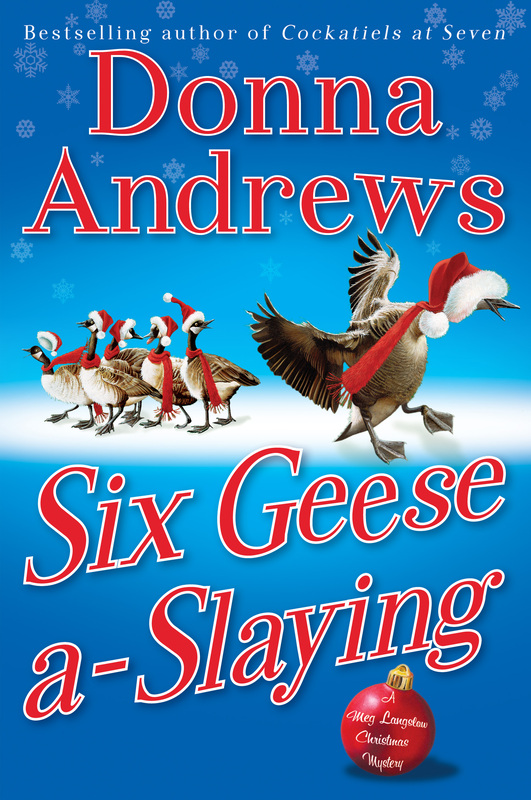 We are pleased to welcome guest author Donna Andrews to the ball. She is a mystery writer, and the winner of countless awards in the genre–the Agatha, Anthony, Barry and Lefty awards among them, and is known far and wide as one of the funniest writers in the mystery field. 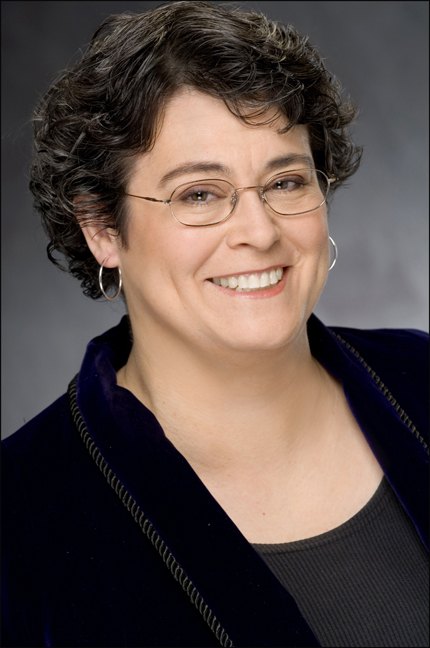 She began her career in 1998 as Deb Meredith just did in 2007–as winner of the St. Martin’s/Malice Domestic Best First Traditional Mystery Award. This year her fourteenth book Six Geese a-Slaying made the extended New York Times Bestseller List. I have a book due in early January. I’ve finished a draft, and it’s pretty awful. Like so many writers, I don’t write fabulous books. I write good books. Or okay books. Or maybe even pretty awful books. But that’s okay–I revise them into much better books. Maybe even fabulous ones. At least that’s what I’ve been muttering to myself this week while working on my revisions. Pruning out stuff that seemed marvelous when I wrote it and now sounds dumber than rocks. Reading a scene that was perfectly intelligible last week and realizing that while it works in my head, I haven’t yet got all the necessary pieces down on paper for the reader. Deciding that an interaction needs to happen earlier or later than it does in the draft, and then realizing how moving that one scene changes so much else, like a long line of dominoes falling over. Determining that I have to figure out a way for one of my suspects to show up way earlier than he currently does. What I like about the draft phase of writing is that it’s as predictable as writing gets. I work by the quota method. If you write a certain number of words a day for a certain length of time–say a thousand words a day for three months–you’ll come out the other end with a book. It may not be a good book–yet–but it exists, ready to be shaped. And by predictable, I don’t mean boring or formulaic. Even though I outline, I never really know what will show up on the page when I start writing. Because I outline, I don’t have to write sequentially, so one day I might leap ahead to the grand finale scene, and the next day jump back to add something to chapter one. I know the general outline of the plot, but I don’t always know what my characters will say or what they’ll do within that outline. I just know that if I show up and type, words appear and eventually the magic will happen. But revising is tough. Unlike a draft, you never know when you’re finished with a revision. Has my rewrite disguised that clue or made it stand out like a black cat on a snowbank? Is that scene funnier now, or was it a lot funnier before I began trying so hard to make it funnier? Do I maybe need to rearrange the plot completely? (Please, God, no!) At least, since I’m writing a series, there are a few things I don’t have to worry about, like whether I should switch from first person to third person narration. But everything else is subject to change. And unlike drafting, when you can chart your progress with your mounting word count, revision’s impossible to measure. Have I done a good day’s work today? The book has about the same number of words as it did this morning. Different words. Better words? Or have I been rearranging Scrabble tiles on the deck of the Titanic? And I love it. Maybe not as much as I hate it, but I love the fact that I do get to revise. Think of Dickens, writing his books in monthly or even weekly installments–and by all accounts he was indeed writing each installment shortly before publication. Maybe he never sat down to work on chapter thirty and realized that he’d written himself into a corner with something he’d done in chapter two. Maybe he never found himself saying, “Blast, but I wish I could revise that!” I bet he did. More often than not. For that matter, how many things outside our books would we love to have the power to revise? How wonderful if we could call up a draft of our lives and retroactively revise, say, our investment strategies . . . some of our romantic or marital decisions . . . our choice of jobs or careers. Branch out to the draft of world history, and eliminate a few of the nastier passages, like the Spanish Inquisition, Jack the Ripper, and the Third Reich. Current affairs could use some work, too: let’s do a global search and replace–change war to peace. But that’s not going to happen anytime soon. And however much fun it is to fantasize about things I’d like to revise . . . that’s not going to get my book done. Back to the grind. What’s in a Black Russian, anyway, and what kind of glass do you put it in? Can I cut out some more dialogue tags here? Should that be “road” or “highway?” Wait a minute—is Meg’s car up at the house at this point, or down at the barn? Do those cows weigh a ton, or only half a ton? Would doing a taste test on that Black Russian count as useful research or writing avoidance? Be patient with me. I’m still revising. Thanks for coming by today Donna! I’m revising, too, and doing a good job at avoiding getting any work done. Hope you have a great birthday today! Welcome to the Ball, Donna. I’m not generally a reader of mysteries (sorry! ), but I suspect Deb Meredith is going to change all that for me this year! But I am a fan of humor and good writing – and anyone can see, you do both well. And what you say about writing and revising are certainly true for all writers. With writing you always know when you get to the end. With revising, sometimes it’s hard to know when to stop. Thanks for being our guest! I know what you mean about revising. But at least by then you’ve got something. I find staring down the blank page the hardest part of writing. I have to put on my Clint Eastwood squint, crack my knuckles, check my holsters, and just go! Good luck. Donna, thanks for being so encouraging about the revising part of this crazy thing we invest ourselves in. I’ve just finished a perfectly awful first draft myself. Gloom, despair and agony showed up at my door when I realized a bit of plot change was in order. That’s what I get for not following what the characters wanted in the first place right? BTW, I fully support your research method in tasting the Black Russian. I mean, how else will you know? Kahlua and vodka, in an old-fashioned glass. Thanks, Donna! I’m revising, too, rather gearing up to do so. I find it terrifying, having to put on that Clint Eastwood squint (ha, Tiffany) and pick apart my manuscript’s flaws…. to go back to the beginning to rewrite! Glad what I had to say on revising was encouraging. I should confess, though, that I didn’t do a lick of revising today–it’s my birthday, so I get to play hooky! What a wonderful post! I’m currently slogging my way through, what my daughter calls the “sloppy-copy” of my mystery novel. It’s been tough working with three kids (one is an active toddler). I’ve finally put myself on a strict 5 page a day regimen instead of waiting until I get the time. I’m actually looking forward to the revision phase since I’ll finally be able to deal with all those nagging questions and problems that pop up. But then, it just might wind up being like my first marathon- I couldn’t wait to run it but once I was in the thick of it I wondered who’s crazy idea this was in the first place. But in the end I was glad I did it!